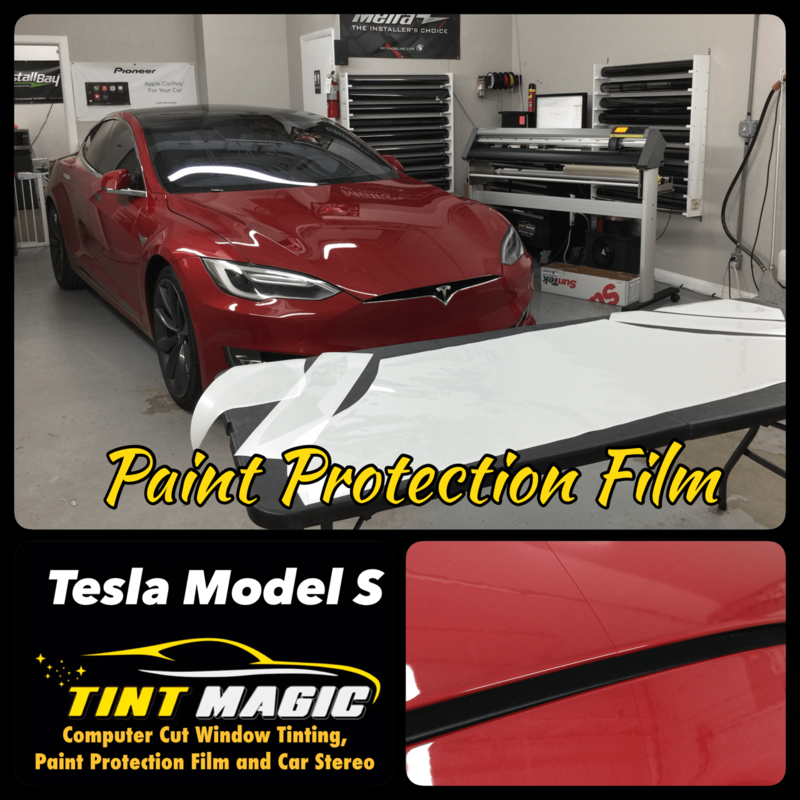 Tesla Model S Paint Protection Film ( Clear Bra) at Tint Magic Window Tinting Coral Springs. Tint Magic Window Tinting use Suntek PPF Clear and 3M Scotchgard PPF to protect the paint of your vehicle. Call us for a free estimate! (954) 840-7883. We are located at 11344 Wiles Road Coral Springs, Fl 33076. -Protect your vehicle from damage caused by rocks, salt gravel or insects. -Virtually invisible and does not alter the aesthetics of your vehicle or factory finish. One-hundred years from now, the Smithsonian museum at our nation’s capital will host a display of history’s most revolutionary automobiles. The collection will include the 1866 Dudgeon steam wagon (one of the earliest self-propelled vehicles), the 1886 Benz Patent-Motorwagen (recognized as the first combustion-powered automobile) and the 1908 Ford Model T (the first automobile mass produced on an assembly line). Most certainly included, among the dozen or so other pioneering automobiles, will be a 2012 Tesla Model S.
At first glance, the cabin appears overly simple (many would consider it spartan). By design, it lacks most of the traditional switchgear, buttons and knobs found in today’s vehicles. However, once the key-wielding operator drops into the driver’s seat, the Model S comes to life – there is no ignition switch – as multiple glass panels are energized. While the primary flat instrument panel (viewed through a sculpted three-spoke multi-function steering wheel) is impressive by itself, it is the center stack’s stunning 17-inch capacitive touchscreen that captures everyone’s attention. The oversized rectangular piece of glass, stretching from the top to the bottom of the dashboard and bordered in aluminum, effectively eliminates all mechanical switchgear for the climate controls, infotainment, navigation, ride height, heated seats, defrosters, moonroof, door locks, truck, frunk, vehicle configuration and more. Although intimidating initially, it is very intuitive and easy-to-use in practice – no owner’s manual required. It is, without question, brilliantly executed. Base price of the Signature Performance is $97,900 – Nappa leather with carbon fiber interior accents, active air suspension and 21-inch alloy wheels are all standard. The black paint is a no-cost item, as is the black upholstery with contrasting piping and gray wheel finish. However, add-ons such as the all-glass panoramic roof ($1,500), anti-chip paint armor ($950), rear-facing seats ($1,500) and high power wall connector ($1,200) will push the price into six-figure territory.